On the first day of 2018, on January 1st there is a Full Moon in Cancer (11˚38”) that will opposite not only the Sun, but Venus and Pluto, too. Also, this Full Moon will trine Mars and Jupiter in Scorpio, and it will trine Neptune in Pisces. In other words, this Cancer Full Moon will be part of a pattern aspect called The Grand Trine, which in our case is a water grand trine. This pattern occurs when three trines are mutually linked in a large triangular figure. The emphasis on the threeness in this configuration indicates a high degree of harmony, joy and contentment. However, it could bring some sort of sensibility, vulnerability, because water signs are always associated with the emotional world, the deeper side of our existence. Moreover, it’s possible during this date to feel strongly the entire emotional accumulations from last month. You could carry with you some degree of deep attachment, sentimental involvement that might reach a culminating point on this day. However this Full Moon will trine both Mars and Jupiter in Scorpio, symbolically bringing exciting moments with even some of us even be able to manage with ease de energy of the day. On January 2nd (GMT) Uranus goes direct starting with 24˚34” Aries. Uranus has been retrograde since August 3rd 2017. It was in the same degree 24˚34” Aries on April 16 2017. Hence, starting with January 2nd we could assist at some significant events, perhaps unexpected social movements or something that may deal with extending or breaking the rules. 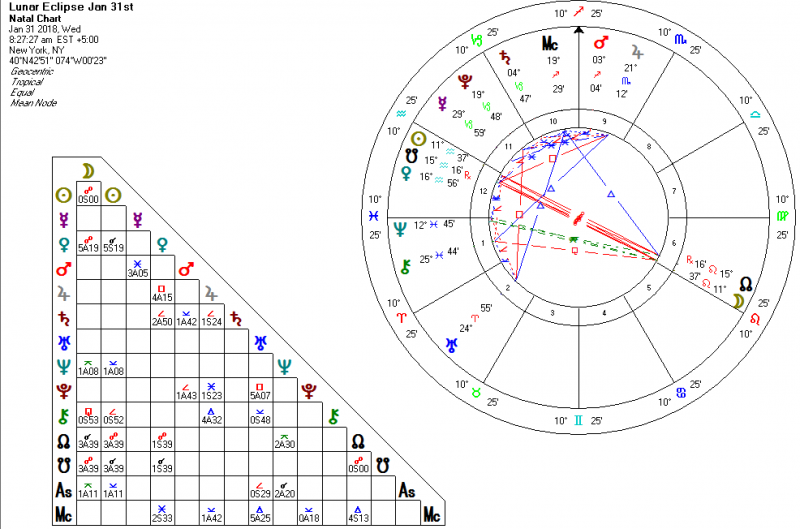 On January 4th Mars will square both North Node and South Node, a day when old elements could determine us to look deep into the past, and it could challenge our present activities. It may affect our enthusiasm, our life drive or our energy. Also, new elements, new skills, new habits may appear into the day picture that could challenge our future actions. So we may want to pay attention to the decisions we will take during this day. It’s possible to meet new people that could have an important role in our near future. However, the day could speed our intentions, perhaps making us impatient. On January 5th Mars will semi-square Saturn, so don’t be surprised if you feel a mild irritation for different reasons, such as: delays, boundaries, bosses, structuring things, work. On January 6th there are three major aspects that could mix up the energy of the day, emphasizing the importance to take actions, in order to expand the quality of life. You may have a natural drive to communicate your ideas to others. Also you could be open to new ideas and concepts. Eventually we could hear unpredictable news, something unusual. 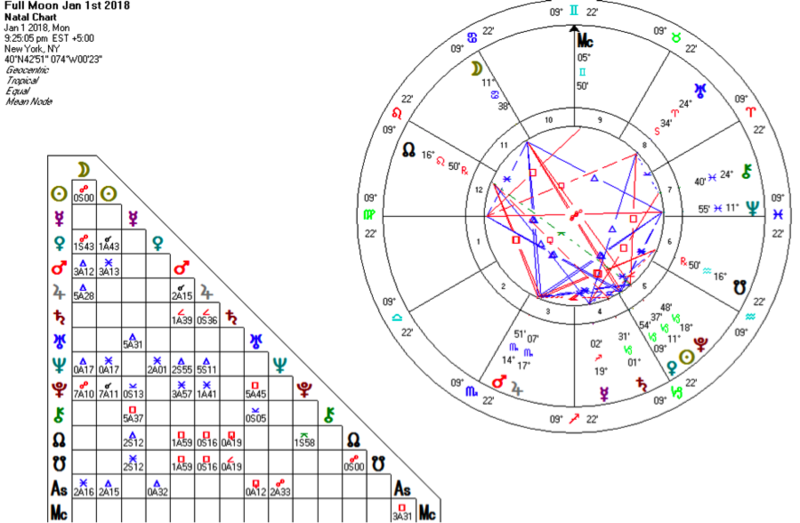 (Mars conjunct Jupiter; Mercury square Chiron and Mercury trine Uranus). Another rich, full of intense energy day is January 9th. Three planets – the Sun, Venus and Pluto will be in conjunction with each other forming a Stellium. The energy of the day could dig into our individuality and it could bring into the light some hidden part of our soul. Pay attention what you like to create during this day! Then, on January 10th Mercury enters in Capricorn, a day when we could start stabilizing our thoughts and focus on future plans. We could use our intellectual energy in a very realistic and practical sense; eventually we could put some ideas in practice during this month. On January 13th serious thoughts would challenge our beliefs. It will be a very unpredictable day, with feminine energy involved. We might feel the urge to do some changes or we may have to make some adjustments. On January 16th there is a New Moon in Capricorn (26˚54”). This New Moon is the Focal point of a pattern aspect called “The Minor Grand Trine”, symbolically supported and energized by the Mars – Chiron trine which sextile it. A New Moon always opens a perspective to plant a seed that could be cultivated by us in the month ahead. It will describe the way we will care and protect it, and the way we will be emotional involved in the growth process. However, an eventual new beginning could be affected or in some cases shaken up by an unexpected tension (Uranus will square this New Moon). Nevertheless, during this time we have six planets in Capricorn: Sun, Moon, Mercury, Venus, Saturn and Pluto emphasizing the importance of having self- discipline, controlling our work and time, in order to reach our long term goals or eventually to ensure security, recognition and success in the future. So the day may show a very concentrated energy in term of manifesting things, using opportunities, making decisions, management skills and professional results. On January 17th Venus enters in Aquarius and it will stay in Aquarius sign until February 10th. During this time you could have a very unique style, originality, and you could be easy detached of others. Also you could attract into your life unusual people, or situations that could help you to see the beauty of life from other angles. Then, on January 20 (GMT) or January 19th, depending of your location, Sun enters in Aquarius, a time when we may have to reform some old ideas and concepts. See where is Aquarius in your natal chart! That area may need special attention during this month. Nevertheless, you could have more activities in relation with that zone. On January 26th Mars enters in Sagittarius. You may use your courage, your ambition and power to lead, and you may want to act in some particular way, in order to expand your life. Check your natal chart and see where you have Sagittarius, in what house? That will be the zone activated by Mars, and a very busy one. At the end of the month, on January 31st there is a Full Moon a total Lunar Eclipse in Leo sign (11˚37”). 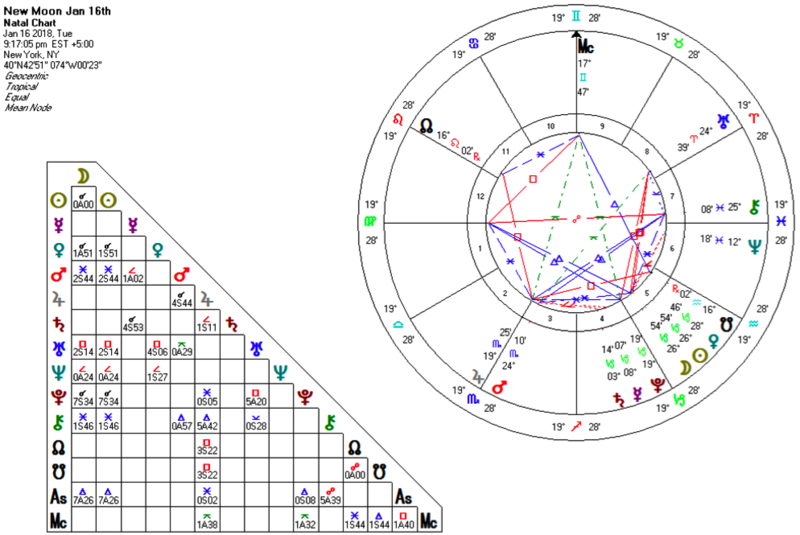 This could be an intense day, especially for people who have natal planets between 10˚- 12˚ Leo or even 10-12 degrees opposite sign Aquarius. It may bring some emotional ends or some concrete results. Nevertheless, It could require us to give up old habits, to let go the old life patterns. You may unfold your memories, that could stimulate old wounds, but you seem to have power and strong abilities to connect your present to a future plan. Wishing you all a very Happy New Year and more blessings in the year ahead!